This morning, Apple lifted the news embargo on its new iPad Air, and the reviews are streaming in. The good news? Most all of them seem to be overwhelmingly positive. The new iPad Air doesn't offer any crazy new hardware features — a better processor, sure — but the standout feature for reviewers and consumers is its more manageable size. Apple made the new iPad 20% thinner and 28% lighter than its predecessor, while narrowing the bezel but keeping the 9.7-inch screen the same size. And, that's enough to sell it, apparently. Former New York Times tech columnist David Pogue praises its slimness more than anything else: "This time around, there’s no gotta-have new feature — nothing on the level of the Retina screen, Siri voice recognition, or even a fingerprint reader (like the one on the iPhone 5s). That big public yawn must drive Apple’s engineers crazy. The thing is, making the iPad smaller, lighter, and faster without sacrificing battery life or beauty is a tremendous achievement." 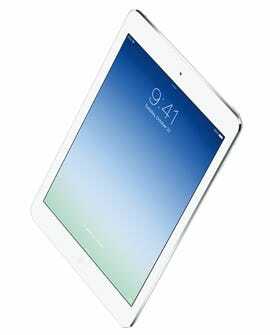 Harry McCracken at Time calls the new iPad Air "strikingly more portable than the one before it." He seconds Pogue: "And there’s so much less of the Air that it comes closer to doing that than any previous full-sized iPad, letting you focus on the app you’re using rather than the device you’re holding. You can even support it in one hand, at least for a bit, without giving yourself a sore wrist. It’s just plain more approachable." AllThingsD's Walt Mossberg was even more to the point: "This new iPad isn’t a radical rethinking of what a tablet can be, but it’s a major improvement on a successful product. It is the best tablet I’ve ever reviewed." He did note that one downside, however, is its high price. CNET's Tim Stevens says he agrees. "Functionally, the iPad Air is nearly identical to last year’s model, offering only faster performance and better video chatting. But, factor in design and aesthetics, and the iPad Air is on another planet. It’s the best full-size consumer tablet on the market." If you want yet more iPad Air praise, check out Fortune's in-depth review of the reviews here. The New iPads Are Here! Welcome The iPad Air!